How can I give an ongoing gift to students through an endowed scholarship? How will my donations to Polk State College Foundation be used? What are the ways I can give to Polk State College Foundation? There are various options for giving to the Foundation. Gifts of Cash or Check – This is the simplest way to give. Checks should be made be payable to the Polk State College Foundation and will be placed in a fund as directed by the donor. Visa, MasterCard and Discover are also accepted. 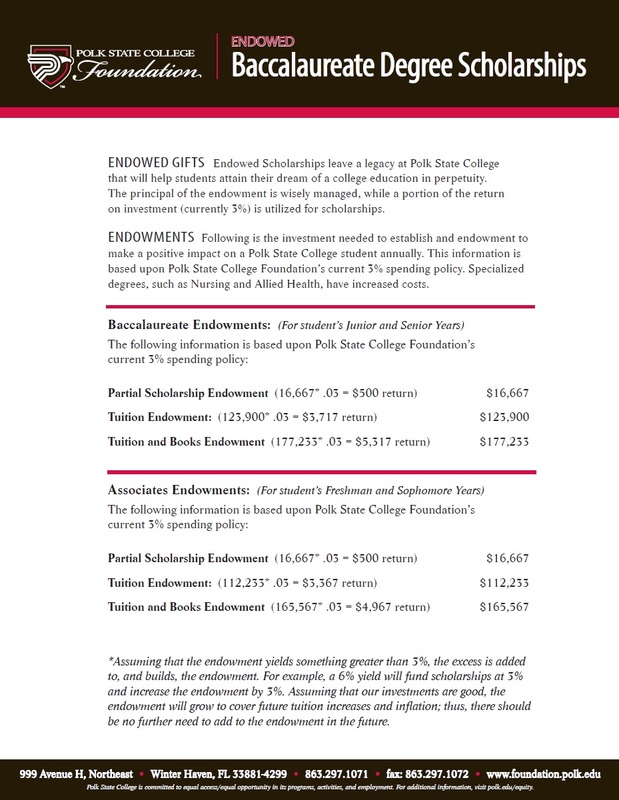 Pledges – Significant gifts to the Polk State College Foundation can be pledged over a specified time period, preferably up to five years. Arrangements are made in accordance with the convenience of the donor. Gifts of Securities – If you contribute long-term appreciated securities to the Polk State College Foundation, you get a two-fold income tax benefit – you can deduct the present fair market value, and owe no tax on the appreciation in value. If you wish to donate securities in which you have a loss, consider selling them instead and then donating the proceeds to us. That way, you will have a loss deduction to offset any gains on sales, plus you will still get your charitable deduction. 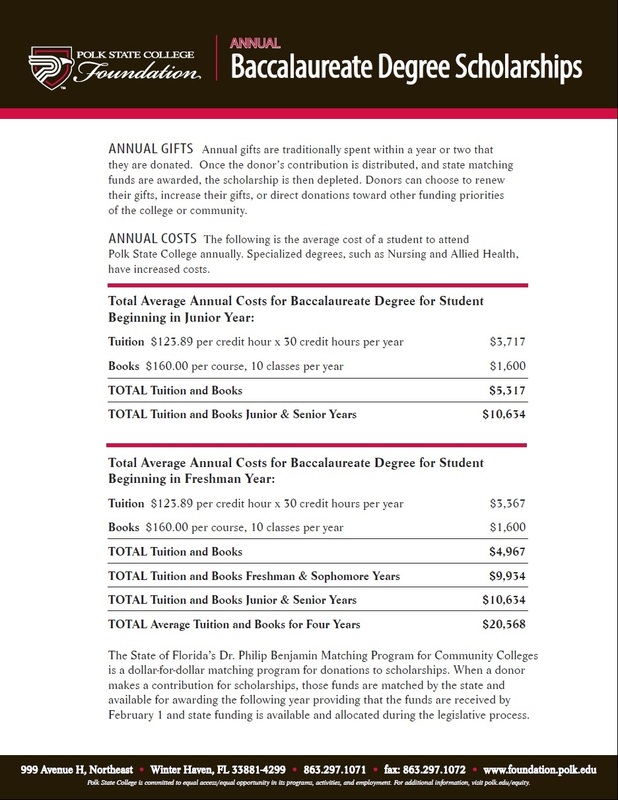 Planned Gifts – Planned gifts provide you with a way to help yourself, your family and Polk State College. We understand that your own financial needs and those of your family come first. Planned giving options provide the opportunity for everyone to benefit. Your needs are provided for now, and the needs of Polk State College are provided for later. With your legal, financial and tax advisors, we can help you create a plan that suits your personal circumstances. Life Insurance – If you now own an existing life insurance policy that no longer serves a purpose, you can assign ownership to the Polk State College Foundation, which may entitle you to income tax deductions. You can also name the Foundation as beneficiary on a current policy or when purchasing a new policy. Property – If you own property that is not subject to a mortgage and has appreciated in value, giving the property to the Polk State College Foundation may be an attractive option. You can claim an income tax deduction based upon the fair market value of the property, avoid all capital gains taxes, and remove that asset from your taxable estate. Bequests – Giving through your will or living trust is a way of providing a charitable gift to the Polk State College Foundation. It can include giving a percentage of your estate, giving a fixed amount, or giving whatever property is remaining after all other bequests are distributed. Charitable Gift Annuities – A Charitable Annuity is a gift of money, stocks, or bonds that is given to the Polk State College Foundation. The Foundation will pay you or a beneficiary a fixed amount on a regular basis until death. A part of this income is tax-free and you also receive a charitable deduction for part of the gift. Charitable Remainder Trusts – These are life income gifts. You transfer assets now to the Polk State College Foundation and establish a trust. You receive a charitable deduction and you or a beneficiary receives a lifetime income. Eventually the remaining assets of the trust pass on to the Polk State College Foundation, Inc. This plan can increase your current income and provide significant tax savings as well. 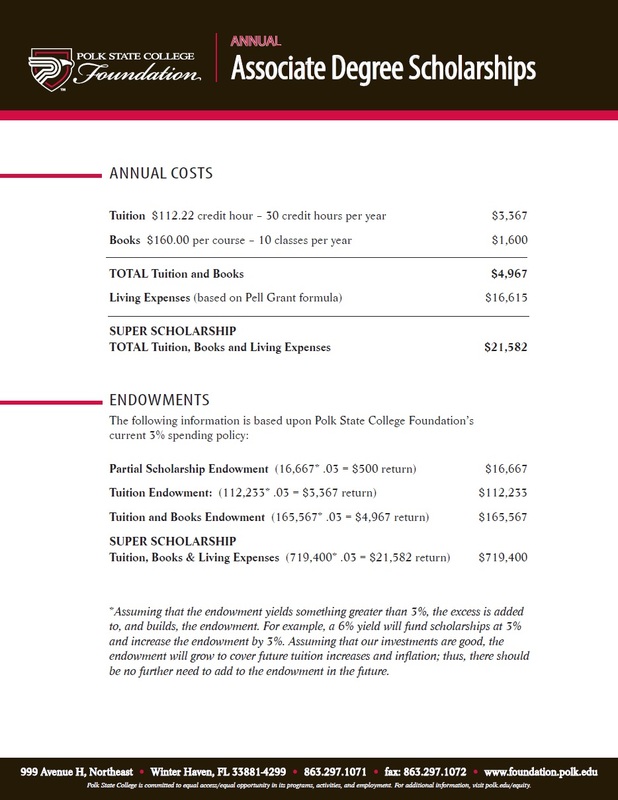 How can my funds be leveraged to maximize the benefit to Polk State and its students? The Dr. Philip Benjamin Matching Grant Program for Community Colleges: Donations for scholarships and facilities are matched dollar for dollar, while contributions to technology and programming are matched $4 for every $6 donated. When a donor makes a contribution for scholarships those funds are matched by the state and available for awarding the following year, providing that the funds are received by February 1, and state funding is available and allocated during the legislative process. Pursuant to Florida State Statute 1011.85, Subsection 12, the Polk State College Foundation is required to notify donors that there may be a substantial delay in funding the Dr. Philip Benjamin matching program. For more information, please call Lynn Wilson, Director of Finance for the Polk State College Foundation, at 863-669-2898. Matching funds through your employer: We welcome any employee programs that will match your donation dollars. Please contact us at 863-297-1071 for more information. Can I make a gift in someone’s memory or honor? Yes. You are welcome to give in a person’s name to pay tribute to them. A special letter will be sent to the person or their family informing them of your gift. Is my gift to Polk State College Foundation tax-deductible? Yes. The Polk State College Foundation is a nonprofit 501(c)3 organization as designated by the Internal Revenue Service. Donations to the Polk State College Foundation are tax deductible to the fullest extent of the law. Gifts to the Foundation are recognized in a variety of ways according to giving level. Examples include: donor listing in Foundation publications and on the web site, and invitations to College and Foundation events. Significant contributions are eligible to receive permanent recognition at a Polk State Campus or Center. How can I make my contribution? Can I make a gift online? Please click here to make an easy online gift to the Foundation.